VICTORY! 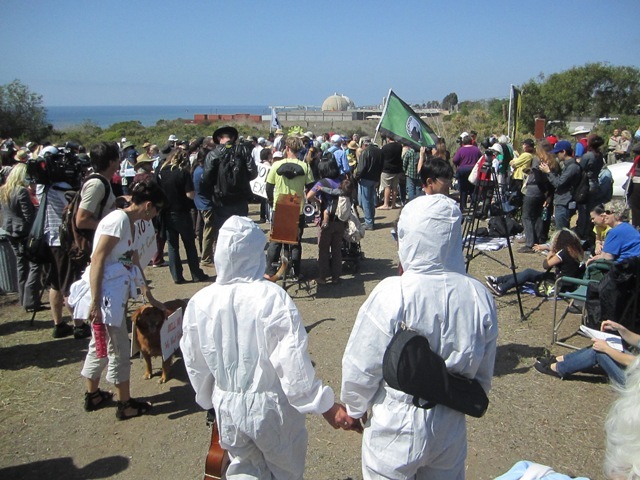 Financial probe of San Onofre nuclear power plant approved! The California Public Utilities Commission voted 5-0 today (Thursday) to institute an “OII” instituting a an “order of investigation” into costs and issues raised by the extended outage of San Onofre Nuclear Plant Units 2 and 3. Congratulations to all who turned out today to urge the PUC to take this action! The Scope and extent of the OII was/is NOT a foregone conclusion—our grassroots spotlight on this is building the momentum for REAL investigation and substantive action. Our coalition’s press conference was well attended. It is all true, of course. The California Public Utilities Commission did decide on Thursday, Oct. 25, to launch an “exhaustive” investigation into the nine-month outage at the San Onofre nuclear plant. The investigation and subsequent changes could result in lowered rates for consumers or having money refunded. And the five commissioners voted unanimously to launch the probe at its meeting in Irvine earlier this week. Their vote is just the first step in a potentially long process, which may not end until after July of 2014. State law does requires the commission to investigate a power generating facility if it has been out of commission for nine months. The probe will look at the costs of the long-running outage, which resulted from defective replacement steam generators at the plant, and at the potential cost to ratepayers from repairs as well as scenarios in which one or both reactors never come back online. According to the order adopted by the commission, ratepayers are paying more than $1.1 billion a year in costs related to the troubled plant. The outage could add to that tab with the cost of studying the problem, repairs, replacement power and potential litigation between plant operator Southern California Edison and steam generator manufacturer Mitsubishi Heavy Industries. There will also be a determination as to whether rate adjustments should be made for customers, whether the utilities acted reasonably and prudently with regard to the replacement of the steam generators and ultimately, the cost effectiveness of the various options for repairing or replacing both units. The schedule adopted by the PUC require the utilities to respond within 30 days. Before the nuke plant can restart again, the NRC must give its approval. Edison, one of the co-owners of San Onofre along with SDG&E, has proposed that it be allowed to restart one reactor, where the issues were less severe, at partial power. The most recent case, involving an outage at a hydroelectric project that was knocked out of commission by a New Year?s Day storm in 1997, was decided in 2002, with the commission approving a settlement between PG&E and PUC’s ratepayer advocate division. The final decision reduced electric rates by $810,000 plus interest. I learned something new today. . .Thank you, Frank. I didn’t know the reactor was down. So, since I don’t understand how “all this” works, do you think, since it’s nuclear, that “we” should shut it down permanently? Sorry to be so uninformed. Frank – not trying to steal thunder here at all, and thanks for all of the coverage the Rag and Free Press have provided as well on this important manner. Feel free to take this comment down if you think it might detract from your coverage. Thanks.